Contours can be displayed in Map View to highlight the difference in time/depth within a slice (see Contouring in Map View). In addition to that, we have extended this feature to allow the creation of polygons for each horizon contour value that has closed contour shapes. Type the Value and Interval at which the contours will be displayed (see Contouring in Map View). Click on Create Polygons from Contours to generate polygon objects for each horizon contour value that has closed contour shapes. 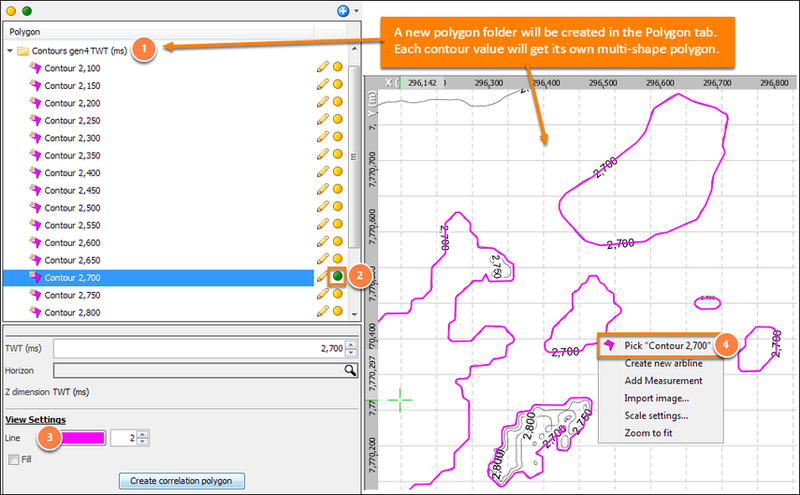 If you wish to create polygons for only ONE contour value, set Value to 0 and type the desired value in Interval. Note: A warning will be displayed if no closed shapes are found. In the Polygon tab of Insight's Control Panel, expand the Contours folder. You can choose to display only the polygon shapes for a single contour value by clicking on the amber icon at the top to disable all, and then enable the polygons at the desired contour value. 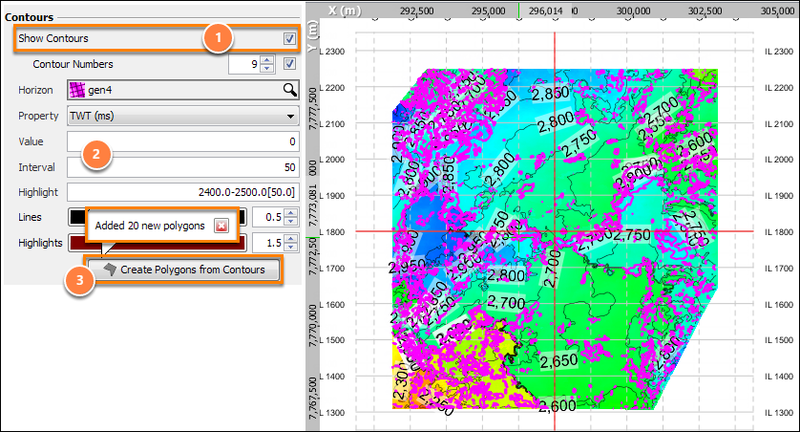 In this example, we display only the polygon shapes for contour 2700ms. Similar to other polygons, you can change the line colour, thickness and fill in the Details Panel (see Picking Polygons in Map View). Right-click within a polygon and select Pick "Contour 2,700" to edit the polygon shapes for that contour value. Alternatively, click on the pencil icon next to the polygon name in the Polygon tab to begin editing (see Editing a Polygon). Each contour value consists of multiple polygon shapes. Tip: While you are still in picking mode, right-click within an individual polygon shape and select Delete Shape to delete the selected shape, or click Delete all points from "Contour 2,700" to delete all the polygon shapes and points for that contour value.